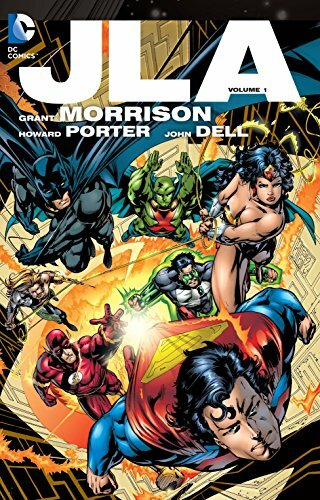 Relive the legendary 1990s JLA series, written by comics mastermind Grant Morrison (FINAL CRISIS) with stunning art by Howard Porter and others, in this amazing oversized softcover collecting JLA #1-9 and SECRET FILES AND ORIGINS #1! The action begins as the JLA reunites to stop the Hyperclan, who have come to Earth posing as a new group of super heroes. But as their true nature comes to light, only the World's Greatest Super Heroes can stop them! Standing side by side, Batman, Superman, Wonder Woman, Aquaman, The Flash, Green Lantern and the Martian Manhunter take on alien posers and come to realize that Earth needs a protectorate made up of only the mightiest icons!